“Bi-products” would indicate Milk Bi-products which both Yogurt and Cottage cheese are. Some stores may have yogurt or Cottage cheese or Sour Cream or all. The layout of the counter in every store is unique based on counter size, set size and of course our customers’ needs. So there you have it. Misspelled or otherwise, there’s nothing more to the sign than “milk leftovers.” Now I have to visit the meat department to see how they label the ground beef and sausages. 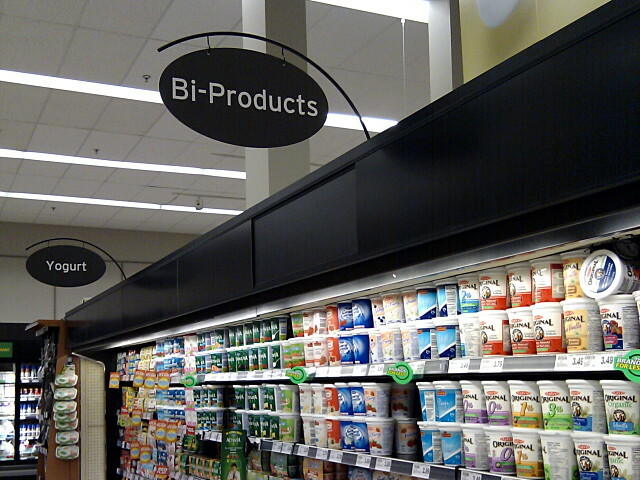 Can someone tell me which marketing genius at Metro thought it would be a good idea to have a whole section of the supermarket prominently labelled “Bi-Products”? Besides seeming wrong on at least two levels, it manages to be both meaningless and off-putting. “Yogurt” is pretty clear. But “Bi-Products”? I thought maybe I was missing some obvious marketing push, but a Google search for “Bi-products” just brings up a lot of what you’d expect, including a site offering buffalo skulls (green or boiled), jaw bones, or feet, all “bi-products” of buffalo ranching. Oh, and a lot of fluff about business intelligence, too. In a food world where “by-product” generally means “stuff that we’d normally throw away because it’s disgusting and inedible, but we found a way to grind it up and sell it to you anyway,” why does Metro think that “Bi-Products” is a good label for premium yogourt? 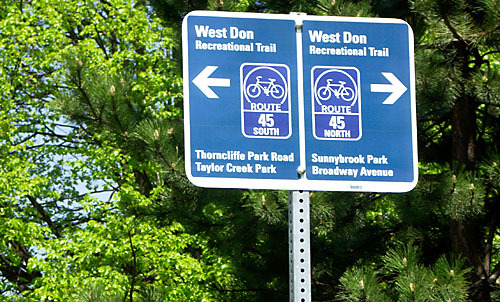 I know that Toronto often gets slagged for inconsistent, poor, and confusing signage, but something makes me doubt that this sign is an official city effort, despite the credit at the bottom. I’ve always wanted to put a message for drivers on the back of my t-shirt or bike, but have never been able to come up with anything suitably brief. This one, seen in Nathan Phillips Square after Monday’s group commute, gets high marks for visibility and clarity. But I think it’s a bit long for drivers to read at speed, and probably invites much disagreement. So far, my own leading candidates are, “Pretend I’m in a car,” and “No, you get off my road.” The search continues. Unfortunately, there’s no word on why the crew that was in tomorrow declared it unfit for use, nor whether it will be back in service yesterday. It’s not called Steeles Avenue all the way out here (we even left the street’s other moniker, Taunton Road, behind a long time ago), but if you start at Yonge Street and travel east for 79 km on the same road across the top of Toronto and through Pickering, Ajax, Whitby, Oshawa, Taunton, Hampton, and Orono, you eventually end up on Concession Road 6 just past Gilmore Road, looking at this sign and wondering if your car has better traction than farm equipment. The answer? The road is fine for a little while, but a soft and sandy stretch was enough to turn me back today. I would have investigated the extra half-block, but I was both bikeless and time-constrained. That’s the problem with exploring in a car: you’ve definitely got more range, but it’s much harder to make detours. Also, if your car gets bogged down in mud, you can’t just throw it over your shoulder and carry it back to more solid ground. Some six months after the last bit of work done on the still-not-quite-finished bike lane on Chester Hill Road, a little more progress was made in January. And not just once, but work was done on at least two different occasions. Now that’s progress. For those not familiar, Chester Hill has a 70 metre long contra-flow lane from Broadview Avenue to Cambridge Avenue. Yes, that’s 70 metres, not 700 metres or 7 km; not even as long as an Olympic sprint. 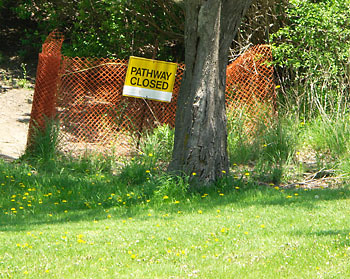 The lane has been worked on in fits and starts since construction began in November 2007. I realize how terribly complex and difficult it can be to put up a few signs and paint a 70 metre long stripe down a quiet residential street, but surely 15 months (and counting) is a little long for the completion of such a short lane. The temporary stop sign that was erected at the end of the lane last spring blew over in late December and was quickly buried under the snow banks that the city ploughs have been storing in the bike lane this winter. It seemed like a perfect metaphor for the bike lane (and the Bike Plan in general). 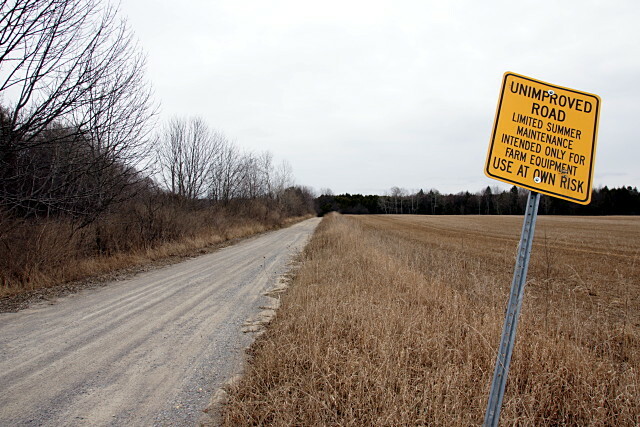 But early January brought an unexpected sign of action on Chester Hill. Not only was the sign pulled out of the snow and re-erected, but it also got two fresh sandbags to hold it upright for another few months. Although the metaphor has changed a bit, it still seems appropriate. 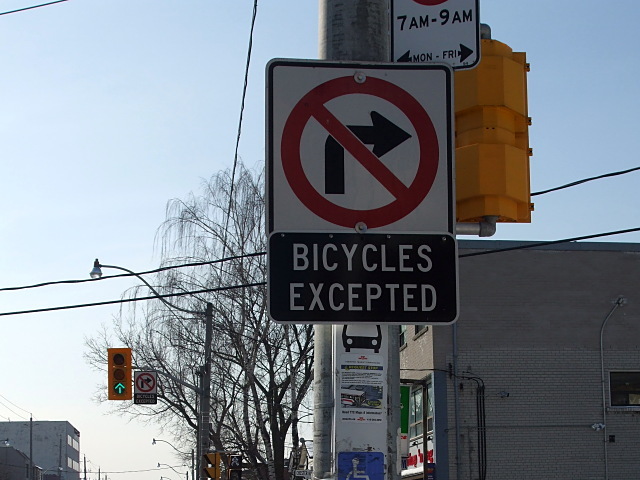 A couple of weeks later in mid-January, another small item was knocked off the to-do list: there are now “bicycles excepted” signs hanging from the “no right turns” signs on Broadview at Chester Hill. Yes, well over a year after construction began, there’s finally some indication that cyclists are allowed to turn onto the road and actually ride the bike lane for the five seconds it takes to traverse the entire length. As far as I can tell, some kind of work has been performed on the lane on exactly six days over the past 15 months: two in November 2007, one each in April and July last year, and now two in January 2009. At least they’re picking up the pace again. I figure that all of the work required to complete this entire bike lane project from beginning to end would take one person no longer than five hours (including a lunch break). In fact, I’m quite confident that if the city dropped off paint, signs, and a ladder at my house, I could have done the entire thing on a Saturday afternoon. At this point, about 4 hours of the work is done. Another few weeks of hard work this coming spring, summer, and fall should be all that’s required to finish the job. The sad thing is that as short as this lane is, it’s actually part of an important and already very popular connector to the Bloor Viaduct. A formal bike lane here is simply an acknowledgement of its long-time use as such. Too bad that it’s been so terribly neglected. At this rate (70m in 18 months, assuming that Chester Hill is finished in May), it would take the city 345 years to finish the bike lane on Lawrence and 8,570 years to finish all of the lanes in the Bikeway Network. 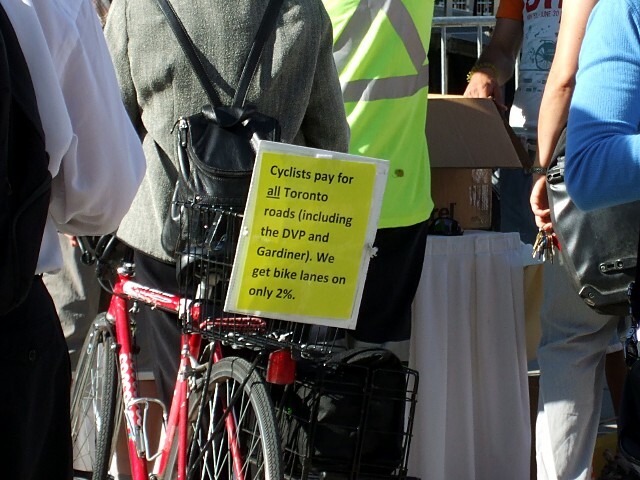 Here’s hoping that the Bike Plan is Y10K compliant. 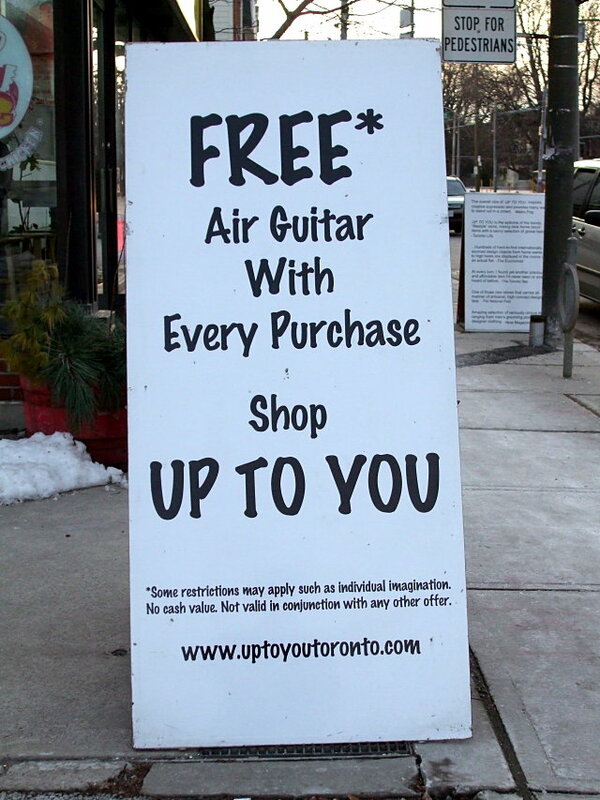 This sandwich board in front of Up To You on Queen Street East has been one of my favourites for a couple of years now. One of these days, I’m going to have to get over my fear that I’m just not hip enough and actually go into the store. What would I do with a new air guitar anyway? I barely use the one I already have. 2. a mere wish, unaccompanied by an effort to obtain it. That is precisely the word (and definition) that came to mind when I first saw this sign guarding a driveway leading to the LCBO store on Yonge Street north of Davisville Avenue. The driveway joins two small parking lots, one that serves the LCBO store to the north and another that serves a smattering of other stores to the south. At some point, someone must have decided that they no longer wanted LCBO customers using the southern lot and the connecting drive. 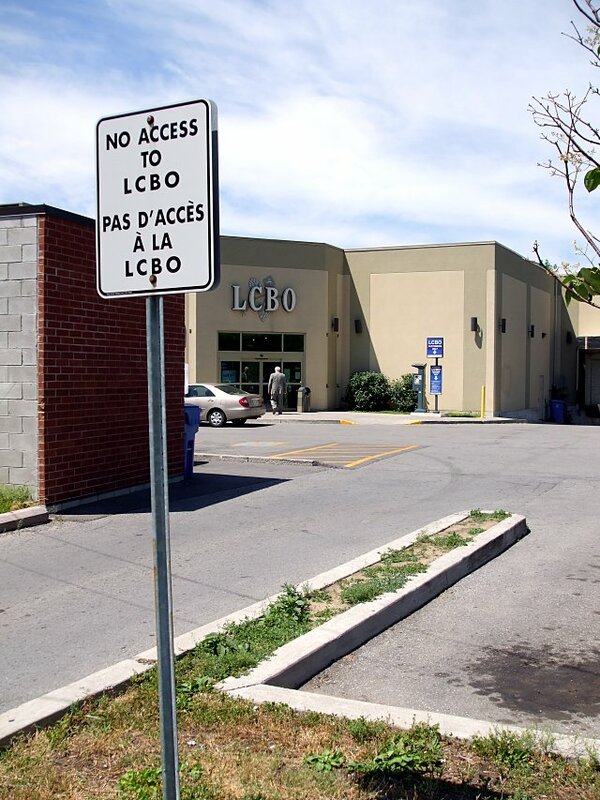 But in the place of an actual barrier to block access, this sign was erected to declare what is quite demonstrably untrue, as both cars and pedestrians regularly cross the unbridgeable (yet smoothly paved) chasm to access the LCBO store’s main entrance. 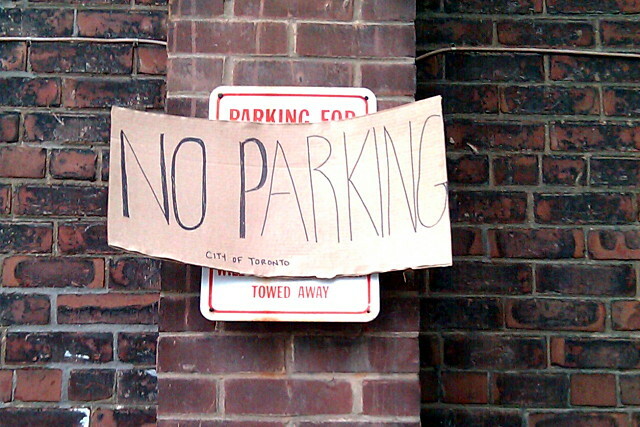 The bilingual nature of the sign indicates that it was almost certainly erected by the LCBO. Bad attempt at traffic control, or psychological experiment? You be the judge. I noticed this beautiful new wayfinding sign in E.T. Seton Park today, just behind the Ontario Science Centre. It’s everything you could want in a sign: bright and easy to read with clear directions. Unfortunately, it’s backwards. The “south” arrow is pointing north, and the “north” arrow is pointing south. Oops. It was probably meant to be mounted on the other side of this post or on one of the still-signless posts nearby. 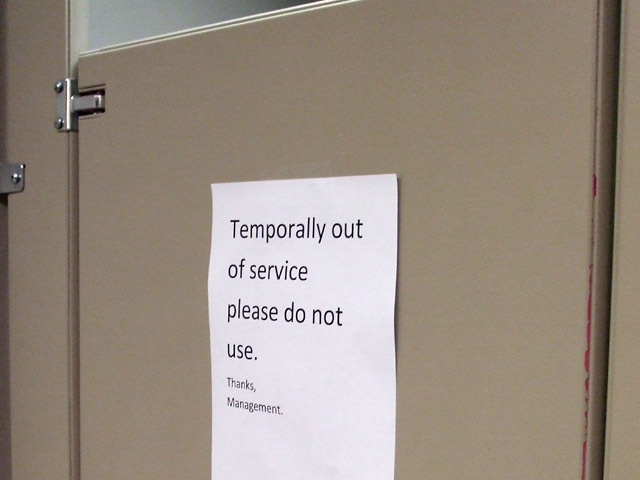 I guess it was a long day for the sign-installing crew. The older sign above, just metres away from the first, doesn’t fare much better. 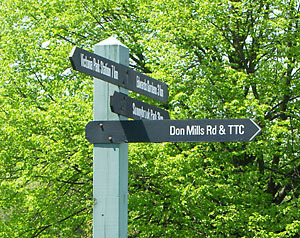 It points the way to Don Mills Road, but directs lost souls up a pathway that was removed and barricaded after being replaced by a nearby link.